Northern Ireland business groups said they breathed a "sigh of relief" after the EU granted the UK a six-month extension to Brexit. The Brexit deadline has been pushed back to 31 October. Stephen Kelly from Manufacturing NI said the UK parliament now had to "make its mind up about what it wants to do around Brexit". "Only at that point will our businesses feel fully relieved," added Mr Kelly. Theresa May said the UK would still aim to leave the EU with a deal as soon as possible. Mr Kelly told BBC Radio Ulster that last week he spoke to one business which invested £10m a week in stock. "They now have three months worth of stock sitting there," he said. "That's £30m that would have been better used in developing new markets or investing in their staff." Aodhán Connolly, director of the Northern Ireland Retail Consortium, said the extension is a relief for consumers and retailers. "Because of this latest extension, we will not be crashing out of the EU with no deal tomorrow," he said. Business groups across Northern Ireland will today be coming to terms with what this Brexit extension means for them. Some wanted a short extension to avoid prolonging uncertainty, others favoured a long extension to give them more time to plan. While businesses organisations have different opinions on what they would like Brexit to look like, they are largely united in wanting to avoid a no-deal scenario. Many of the representatives in Northern Ireland are in favour of Theresa May's Withdrawal Agreement - CBI, FSB, NI Chamber. That's not necessarily because they are fans of the deal, but they think it is the least worst option. Something they can plan for. What they all want to avoid is a no deal scenario which many sectors have been planning for. Retail NI chief executive Glyn Roberts echoed Mr Kelly's statement. "There will be relief right across the local business community that we are not crashing out of the EU this week. It would have been a complete disaster for our economy," Mr Roberts said. "Retail NI is very clear that we need to see a deal and this postponement gives the government and the Labour Party more time to reach an agreement." 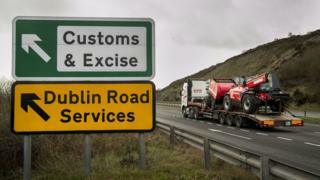 Image caption Ulster Farmers' Union president Ivor Ferguson said farmers were being placed under "tremendous stress"
Ivor Ferguson, president of the Ulster Farmers' Union, said it was good news for agriculture that a no-deal scenario had been avoided. However, he added: "The continued uncertainty is damaging our agriculture industry. It is putting tremendous stress on farmers financially and mentally. "We need immediate clarity about what our future business and trading relationship with the EU will look like to be able to plan accordingly." He said the further extension "must be used constructively". Michael Bell, executive director of the Northern Ireland Food and Drink Association, also welcomed the avoidance of a no-deal outcome. However, he warned that continued uncertainty was bad for business and could lead to job losses. The extension means the UK will not leave the EU without a deal on Friday, but Mr Connolly said businesses are still spending hundreds of millions of pounds to mitigate against a no-deal Brexit. "This represents time and resources that would be better spent improving customer experience and prices," said Mr Connolly. "The timing of Brexit may have changed but our message remains the same: Business and households in Northern Ireland need a deal. "The alternative is a no-deal Brexit which will affect jobs, prices and hit the most vulnerable in society hardest." Retail NI's Mr Roberts said that "if no withdrawal deal is agreed, revoking article 50 should be considered as opposed to the nightmare scenario of leaving with no deal". Image caption Glyn Roberts warned that a no-deal Brexit would be a "complete disaster"